External resin regeneration vessels with base removed. Separation achieved regardless of resin volumes allows for resin ratio to be adjusted without compromising performance. To enhance the detection of the cation/anion interface, approximately 2 mg/l of acidity (CaCO3) via gaseous carbon dioxide, is introduced into the resin transfer water. This acidity increases the conductivity of the water, and is taken up by the anion resin, thus lowering the conductivity. This drop in conductivity indicates the beginning of the interface of the cation / anion resins. As a secondary check, an optical device detects the change in resin color by measuring the increase in reflectivity as the anion resin replaces the cation resin. After separation, the separated resins are ready for simultaneous regeneration. 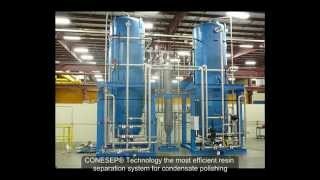 The first step in this process is to lower the water level to near the surface of the resin in both CONESEP® units. This is followed by the injection of 5% sodium hydroxide at 6 BV/h into the separation / anion regeneration unit and 5% sulphuric acid at 5 BV/h into the cation regeneration / mix and hold unit. Regenerant injection is followed by a displacement rinse. At this point in the regeneration sequence, an optional cleaning step can be included to allow the individual cation and anion resins to be cleaned, if operating experience shows this to be of benefit. The resins are given individual displacement and fast rinses. On completion of resin rinsing, the anion and cation resin is hydraulically transferred to the cation regeneration / mix and hold unit. The unit is then partially dewatered and the resins are mixed by air and further rinsed to ensure that no chemicals are transferred to the polisher units. The contents of the resin interface isolation unit are transferred to the separation / anion regeneration unit prior to the next regeneration sequence and await the receipt of an exhausted resin charge from the polisher units for separation and regeneration. Yes, this is a core technology for us and we have over 30 years experience in supplying these plants around the world. 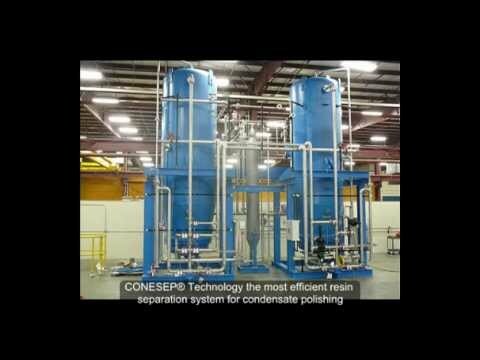 Which office do I contact to enquire about CONESEP and condensate polishing?